This novel by Sankarshan Roy was published in Bangla 1378 Ashwin or October 1971 in Kishor Bharati Patrika. He was a professor in profession, but he is a full-fledged literary writer. After retiring from the post of Geological Survey of India, he was involved in mineral-based industrialization in West Bengal. He made the subject geology easier and more attractive to the common people by through his writings, he presented the article as a story and gave it name 'Progalpo'. Not only soil and minerals, but the wilderness life that is centered on the property below the soil, through his pen those people and animals also entered the Bengali literature. 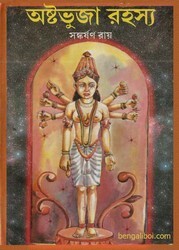 Today I want to share a children ebook pdf of his written- Ashtabhujar Rahasya. The pdf has 76 pages 6mb file size.